Vav Hakobyan was born in 1987, in Yerevan. He enrolled in the Mkhitar Sebastatsi Secondary School in Yerevan in 1994 and in 1995 he took courses for sculpturing and painting, while taking part in several art exhibitions. In 1999 he got accepted to the Mkhitar Sebastatsi Art School and became a member of the “Agrogitaspyur Youth Club” until the year 2002. During his studies in the Art School, Hakobyan took several courses in sculpturing, painting, woodcraft, ceramics and graphical painting, as well as carpet weaving. Between 2000 and 2002 he took part in many sculpturing symposiums along with famous Armenian sculptors. In 2002, Hakobyan was accepted to the Panos Terlemezyan Art College, Faculty of Fine Arts in Yerevan, Armenia. During his studies in this College he took part in many student exhibitions in the National Gallery of Armenia, the Artist’s Union of Armenia, the Terlemezyan Art College, the Tumanyan’s Museum, The Union of the Armenian Architects, the Tamanyan's Museum. Hakobyan has completed his obligatory military service between 2005 and 2007. 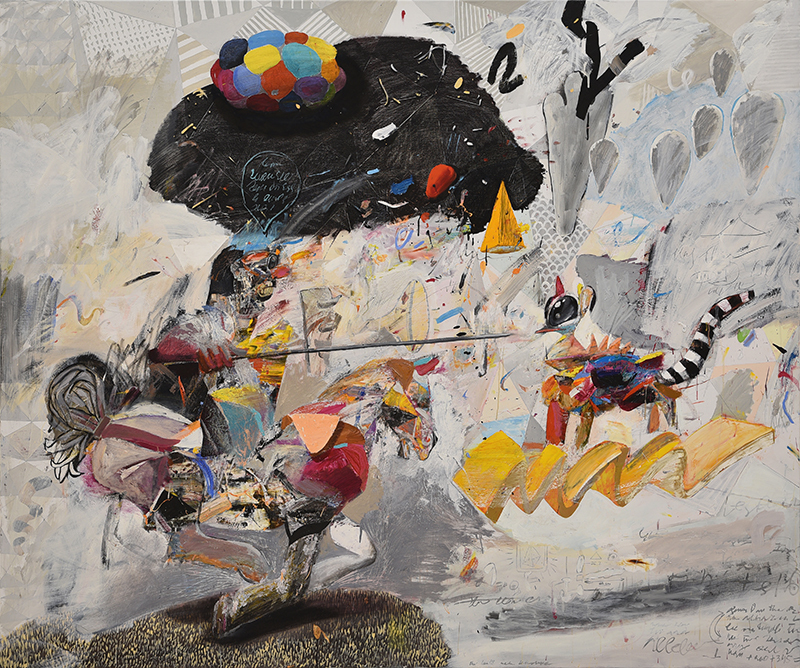 Returning from the army, Hakobyan continued his studies in Terlemezyan Art College, after which in 2009 he got accepted to the Yerevan State Academy of Fine Arts. 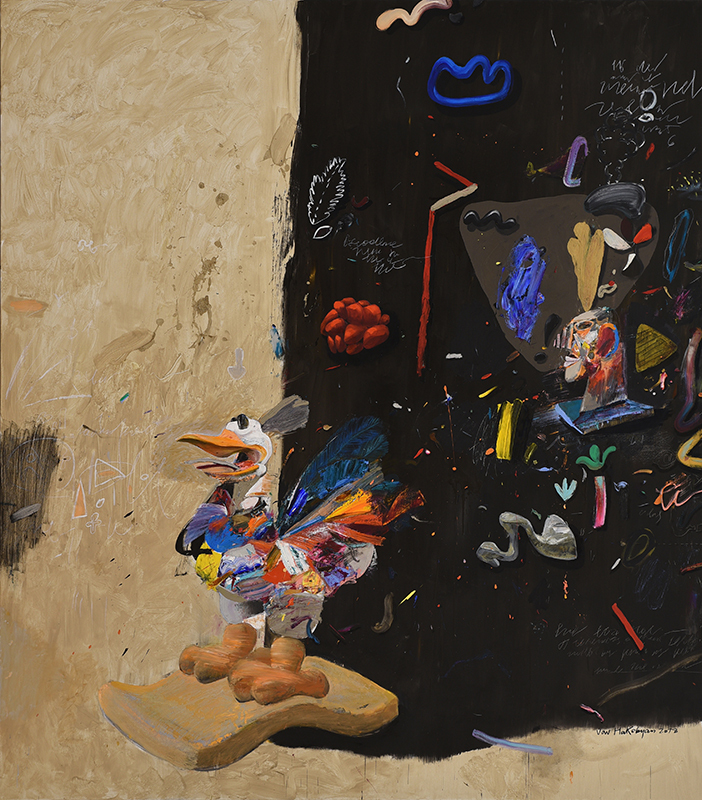 During his studies at the Academy, Hakobyan participated in several group exhibitions, as well as organizing a personal exhibition. He graduated from the university in 2013 with an honorary degree granted by Edward Isabekyan. 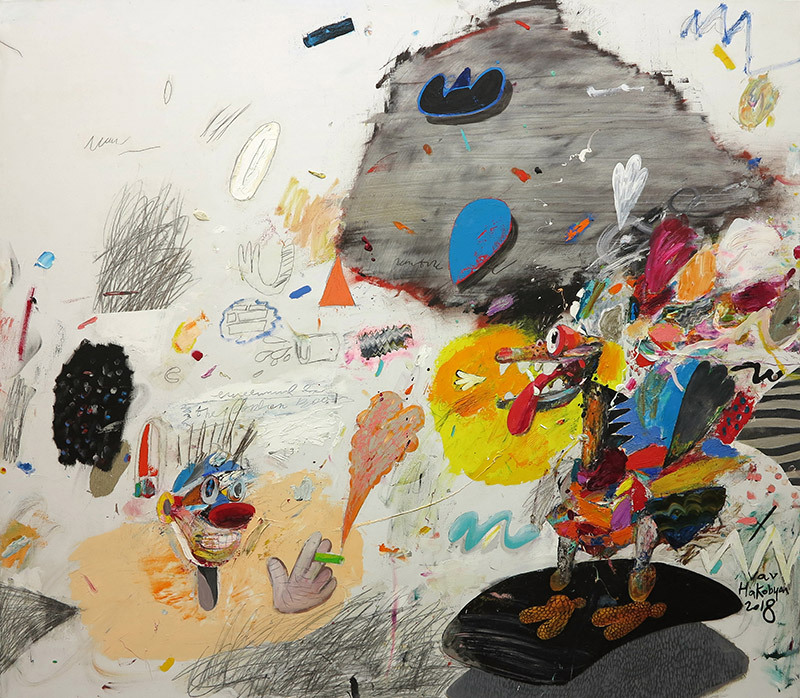 His solo and group exhibitions include National Gallery of Armenia (2009), Museum of Alexander Tamanyan – Yerevan (2010), Studio Gallery – Yerevan (2011), Gala Art Gallery – Yerevan (2012), Gala Art Gallery – Yerevan (2013), World Art Dubai (2015), Gala Art Gallery (2015). 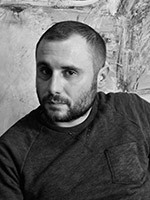 Vav Hakobyan's artworks can be found in private collections and public museums throughout the world; in countries such as Armenia, Russia, China, France, Germany, Spain, Canada, Lebanon, Turkey, USA and others. Since 2017 my painting and working style had a drastic turnaround. I decided to refuse the building style of composition by which I was guided for years. I started paying less attention or completely eliminated from my painting the dogmas, which were preventing my imaginary free doings. I began not classifying my doings and not thinking about their sequence. Balanced composition, symmetry, light position, prospect, history and even painting's balance of saturation stopped being interesting for me. I am interested in new forms, new figures, that don't have past and future, that don't exist in reality and have no history. They are discovered and seen move on the canvas or outside of it independently, depending on moment's influence not following my caprices. I am interested in the change of forms, the transformation of figures, unpainted spaces on the canvas, incompatible diversity, the extremeness of contrasts. This is an endless process and as the painting's final look is not important to me, the efforts to make a painting on purpose make it meaningless. 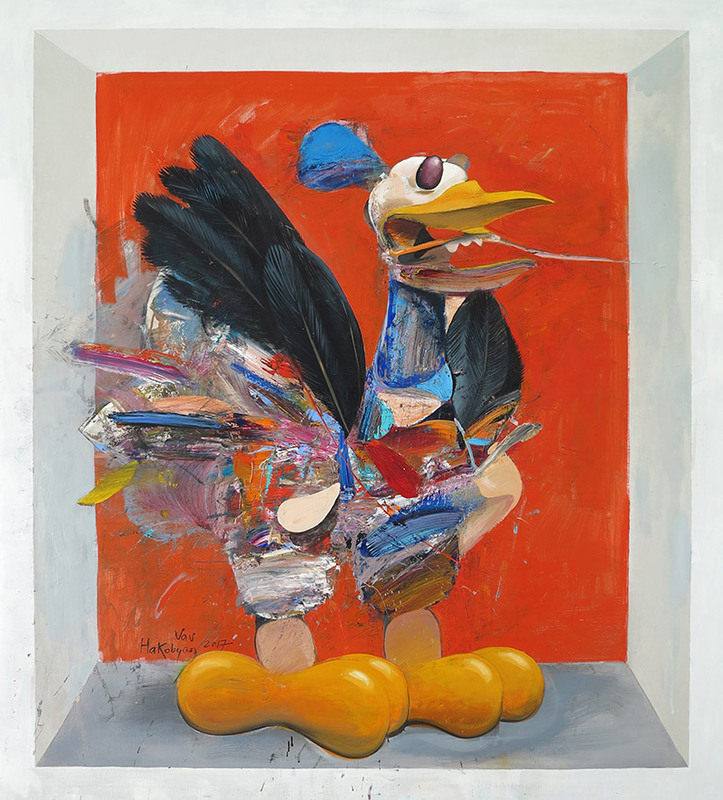 Bright and saturated colors, a peculiar interpretation of reality, and clear designations of objects – all this characterizes the Vav Hakobyan’s work. Looking at the art of the painter one can say that the artist explains reality through personal perception, turning gray reality into more vivid and abstract forms. He expresses the reality by his own perception and interpretation of life. His highly original style utilized bright colors to portray imaginary creatures and people which are caught in statuesque poses. 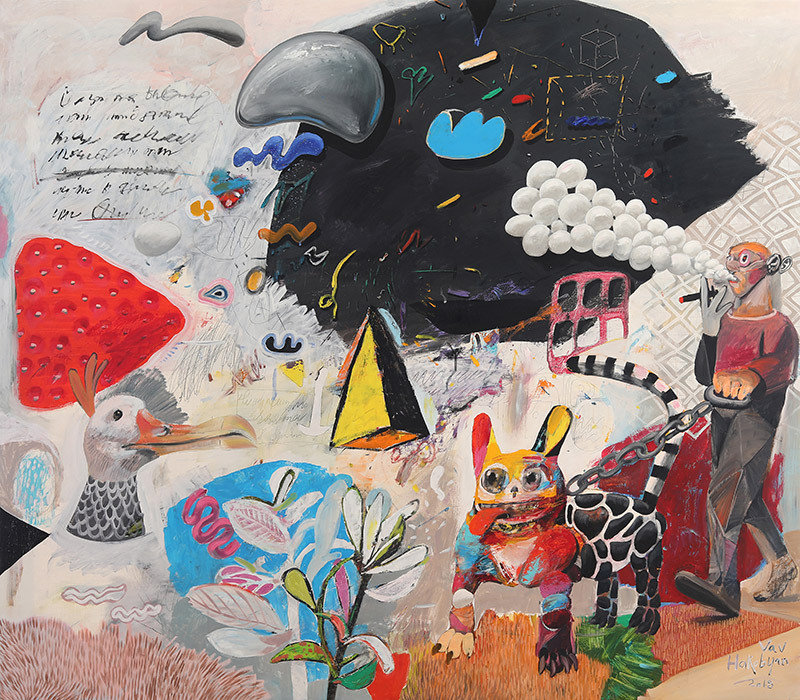 Hakobyan explored mystical and fantastic themes in his paintings. His paintings stress the poetics of color in their delicate harmonies of hues, while his subject matter was highly personal in its mythical and dreamlike figures. The forms tend to be outlined in flowing, heavy contours and have few details: the brushstrokes are laid on in large, thin, luminous, carefully calculated patches, shadows are practically eliminated and the depicted space is either extremely shallow or warped into a flatness that parallels the plane of the canvas and defies academic rules for perspective and foreshortening.